Tool Intent: Right Angle Mini-Orbital Sander is ideal for finesse sanding. Do Not Use Tool For Anything Other Than Its Intended Applications. This power tool is not intended for use in potentially explosive atmospheres and is not insulated against contact with electrical power. Training: Proper care, maintenance, and storage of your tool will maximize their performance. • Employer&apos;s Responsibility – Provide Right Angle Mini-Orbital Sander operator with safety instructions and training for safe use of tools and accessories. • Abrasive/accessory RPM (speed) rating MUST be approved for AT LEAST the tool RPM rating. • Before mounting an accessory, visually inspect for defects. Do not use defective accessories. • Use only recommended accessories. See back page of manual and Dynabrade Literature. 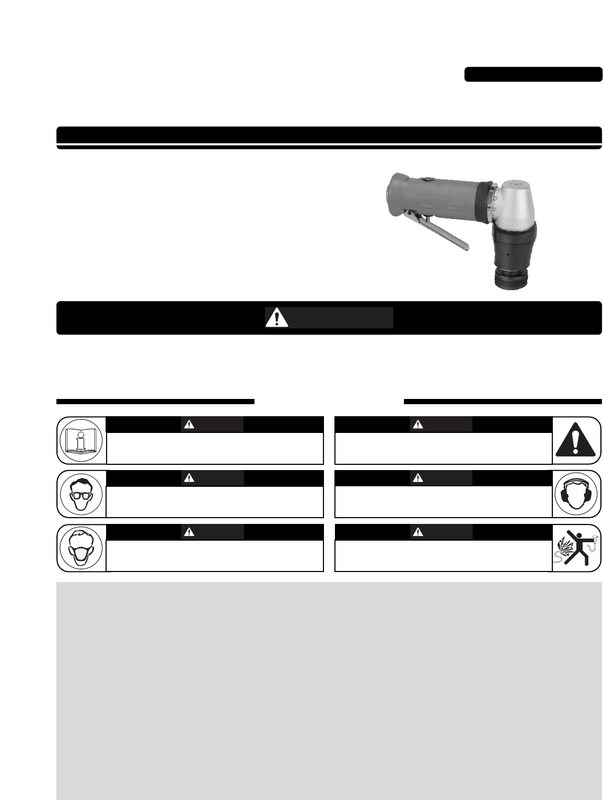 • Follow tool specifications before choosing size and type of accessory. eye protection to conform to ANSI Z87.1. limit values required by law. the influence of alcohol or drugs. local statues, ordinances and/or regulations. frayed or deteriorated air hoses and fittings.